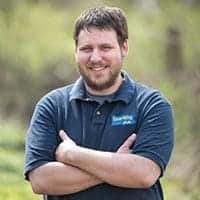 When I first visited State College, I was told that if I hadn’t been on Mount Nittany’s hiking trails, I hadn’t truly visited State College. So, on a later trip to the area, I decided to do just that. 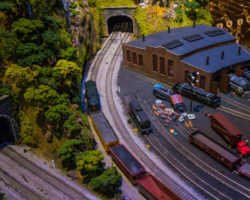 Located just outside of downtown State College and the Penn State Campus, Mount Nittany (officially known as Nittany Mountain) is a focal point for the region visually, culturally, and historically. 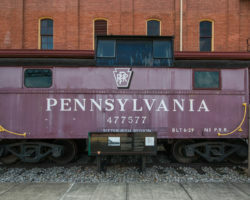 In fact, the mountain is so engrained in the area’s culture that Penn State’s teams are known as the Nittany Lions. The trailhead for Mount Nittany. 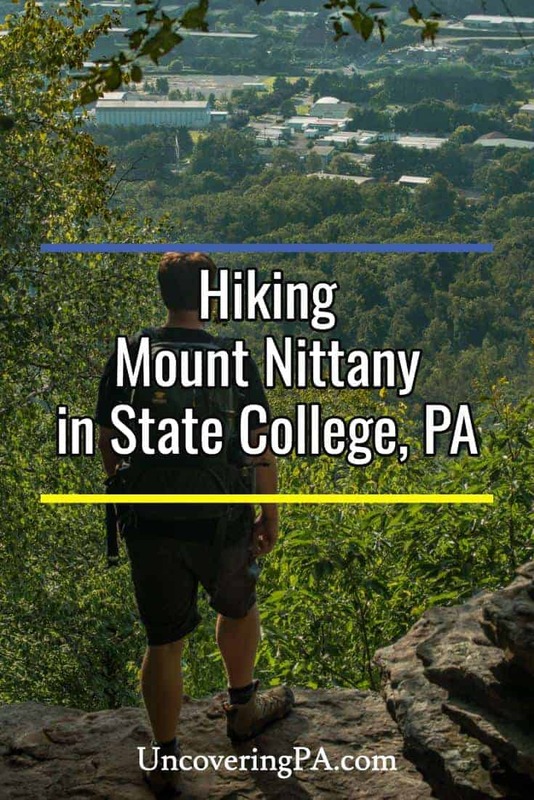 Today, Mount Nittany is a popular hiking destination which offers natural beauty close to State College and some amazing vistas overlooking the valley. 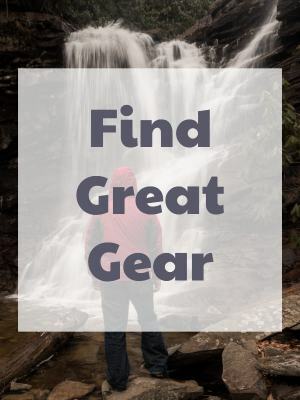 The mountain is criss-crossed by roughly 7.5 miles of trails, which offer a variety of hiking options depending on how much time you have. 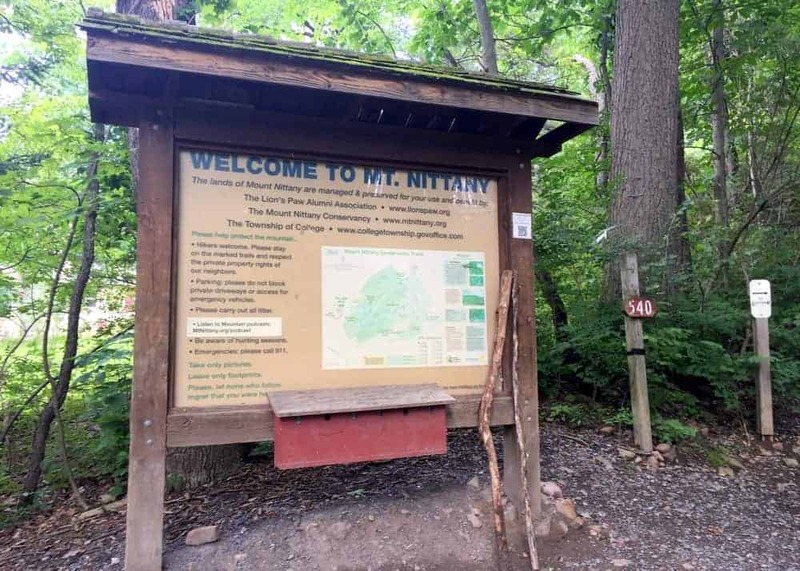 Mount Nittany hikes start from the parking area in Lemont, roughly 3-4 miles from downtown State College and the Penn State Campus. There is a small parking area adjacent to the trail which fills up quickly on weekends or summer days. Overflow parking is available in a nearby parking lot. The hike starts off with a steep climb ascending approximately 600 feet in the first half mile. However, once you get to the top of Mount Nittany, the trails feature gradual rolling hills and don’t present much of a challenge. 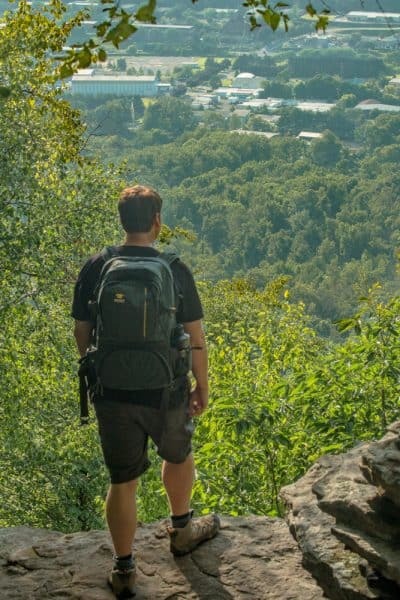 The Mike Lynch Overlook is the first and best vista you’ll come to on Mount Nittany. 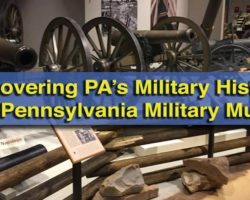 While shorter hikes are an option, I decided to do a five-mile loop that allowed me to see the best that Mount Nittany has to offer including all seven of the overlooks on the trail map. After ascending the hill (making sure to stay to the right at the one trail split on the way up), I completed my loop along the outermost trails in the counter-clockwise direction. Stay to the right when ascending Mount Nittany. Of the seven overlooks, the first one that you come to, known as the Mike Lynch Overlook, is probably the most impressive. 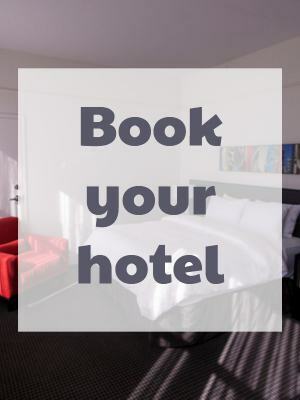 From here, you have a commanding view over State College and the Penn State Campus. The most noticeable feature being Beaver Stadium, which is the third-largest stadium in the world. 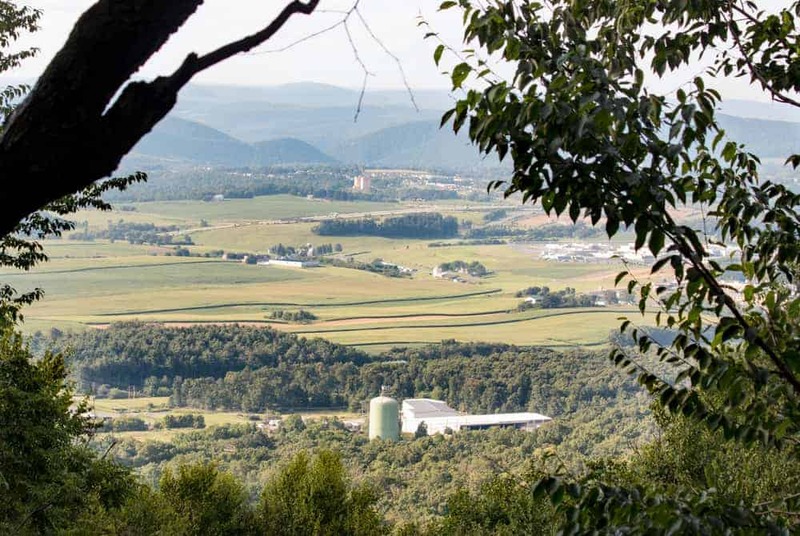 If you want a shorter, but somewhat challenging hike on Mount Nittany, it’s about a mile round-trip to see this vista. 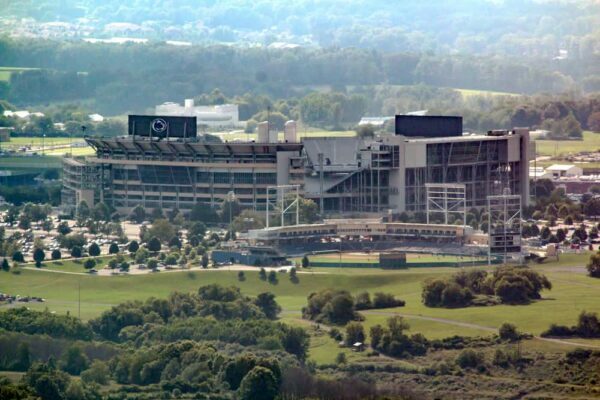 Beaver Stadium as seen from Mount Nittany. Continuing on along the ridgeline of Mount Nittany, the trail passes through this beautiful mountaintop forest. Vistas are spaced roughly every half mile to mile. 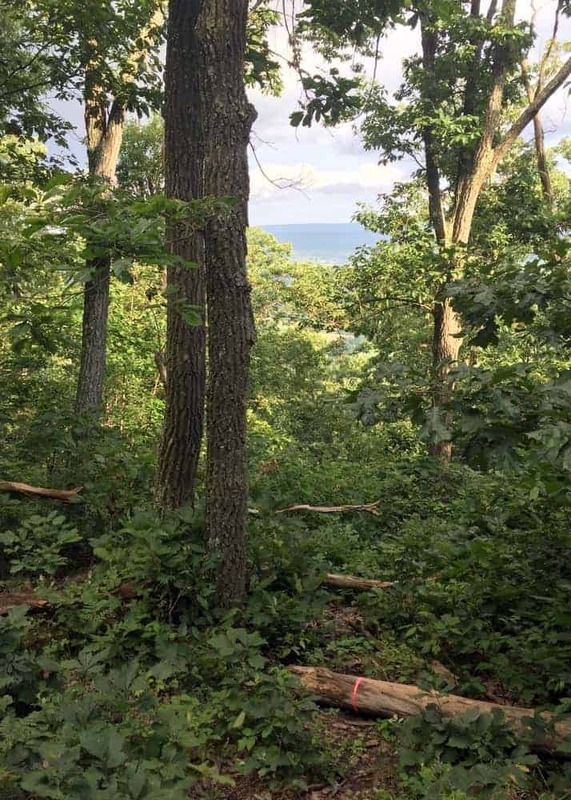 Some of these vistas are barely more than small holes between trees and offer marginal views during the summer months, but would be more substantial with fewer leaves on the trees. 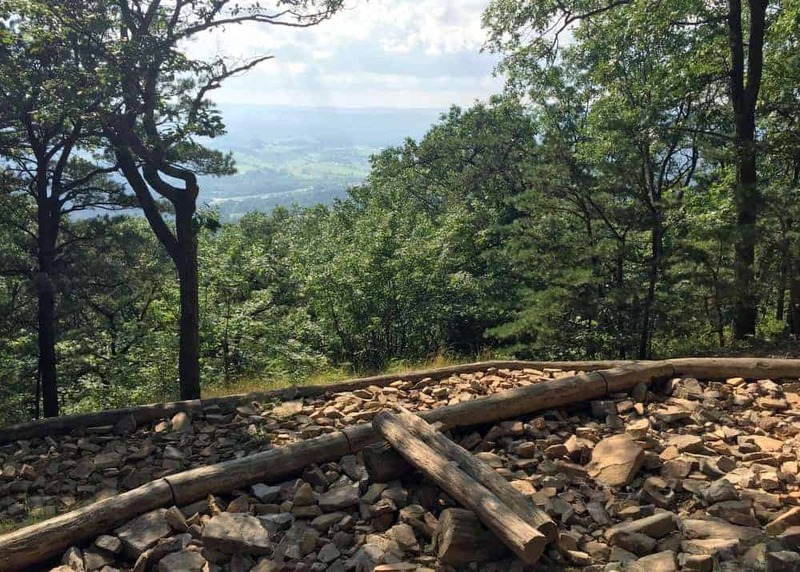 Hiking Mount Nittany’s ridgeline, however, is quite beautiful and peaceful, especially the further you get from the parking area. Close to the parking area, this trail can at times feel a bit crowded due to its popularity. Some of the marked overlooks don’t have much of a view during the summer. 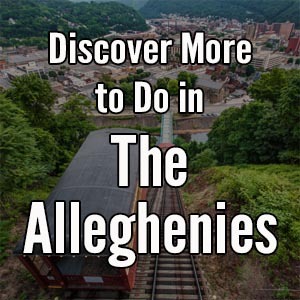 To complete the five-mile loop, continue to follow the trails along the ridgeline, staying to the right at any splits. 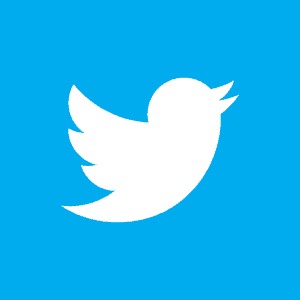 Eventually, you’ll reach a signpost marked with the number 10. At this point, you can continue straight to see the final vista or take the trail to the right to head down the hill. If you opt to head down the hill at this point, you’ll cut a few tenths of a mile off of the hike, but you’ll be heading down a significantly more difficult hill. 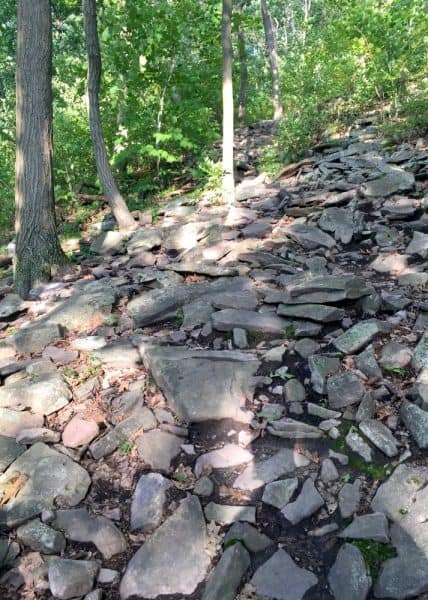 In places, this resembles more of a dry stream bed than a trail and can be quite technical in places. The secondary trail up and down Mount Nittany is quite rocky. 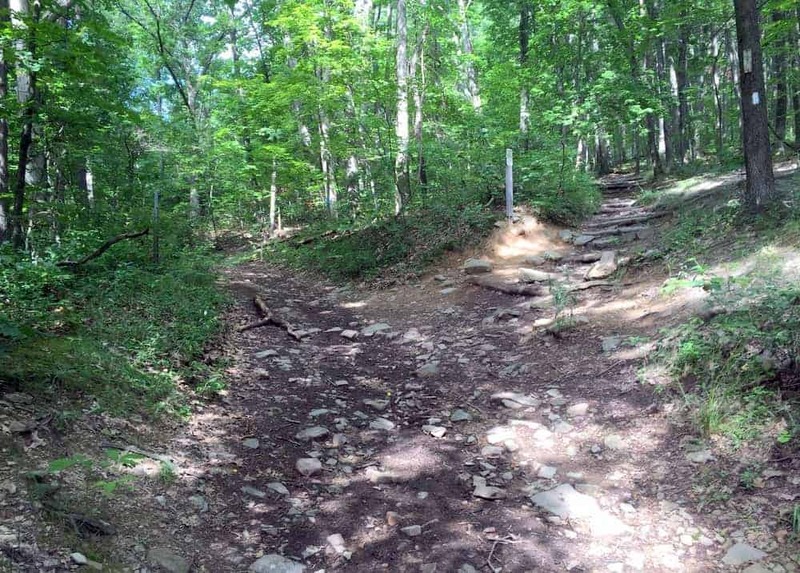 No matter how you go, a loop of the trails on Mount Nittany is a great way to spend a few hours. You’ll not only be able to enjoy the outdoors, but you’ll also see a few fantastic vistas along the way. 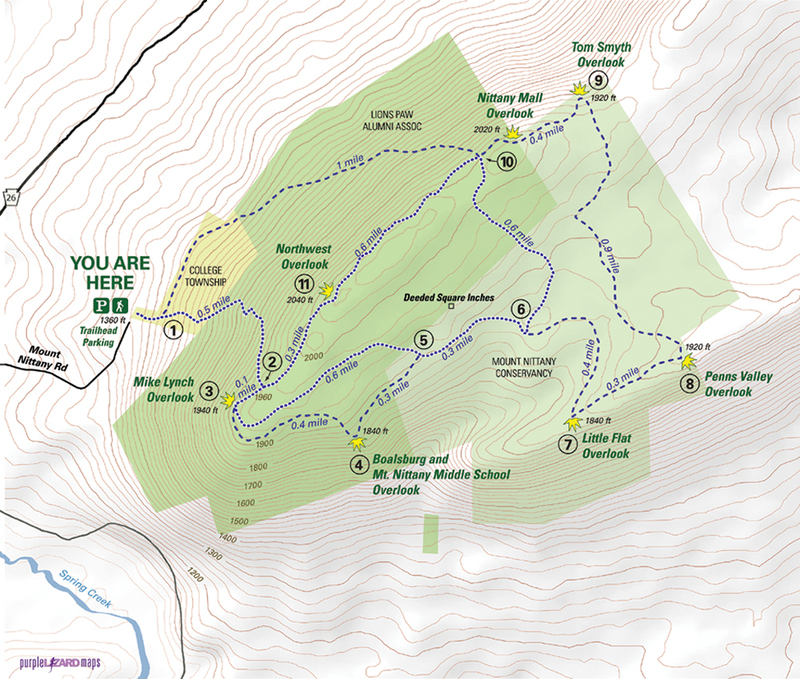 To follow in my footsteps, use this map from the Mount Nittany Conservancy. Simply start at number one and follow the numbers until 10. From there, you can either head directly back to the parking area near number one or continue past number 11 and back to the parking area. Another great view from the top of Mount Nittany. 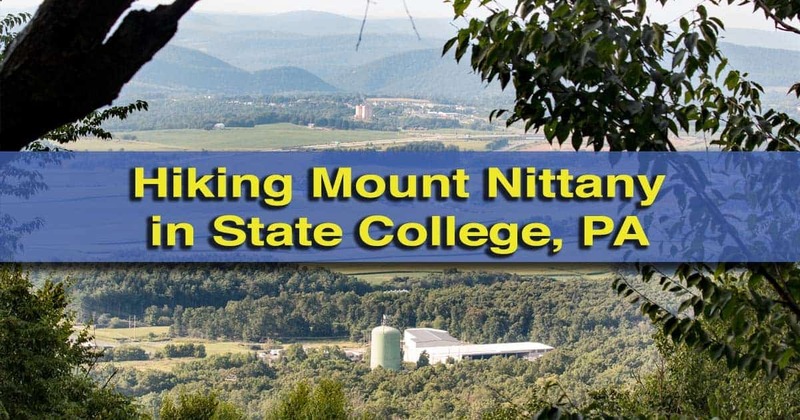 Mount Nittany is located less than four miles from downtown State College, and it is one of the best things to do in Centre County. Parking and the trailhead for the hike can be found at the following coordinates at the end of Mount Nittany Road: 40.811513, -77.807014. There are only a few parking spots at the trailhead, but there is an overflow lot nearby. You can also park along Mount Nittany Road, just make sure to respect private property and keep the road clear for other cars. 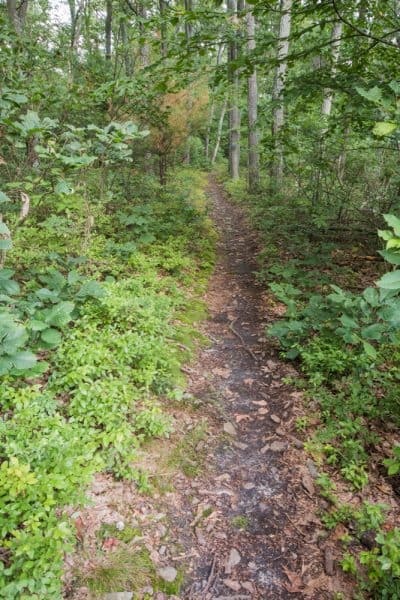 A beautiful hiking trail on Mount Nittany. It’s also worth noting that hunting is allowed, so if you are hiking Mount Nittany during hunting season, wearing an appropriate amount of blaze orange is advised. 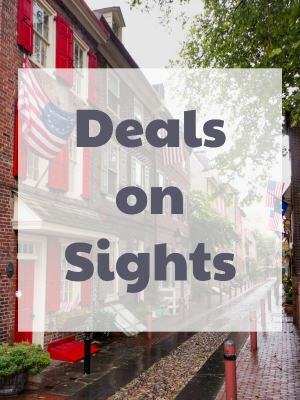 Looking for more outdoor things to do in and around State College? 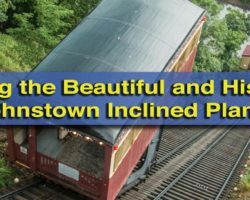 Check out Penn’s Cave, the Penn State Arboretum, Yost Run Falls, and Raystown Lake.